KMC Systems mechanical engineer Austin Lines tackles Kyrgyzstan’s un-summited Pt 5318 mountain. 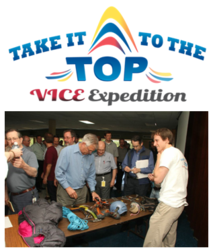 Austin Lines, right, discusses the VICE Expedition at KMC's Take It To The Top event. It's my first big mountain, so it's a big challenge for me. I want ot see if I can do it - if I can rise to the occasion. Medical device development, design, manufacturing and support company KMC Systems, a division of Elbit Systems of America, LLC, is tracking mechanical engineer Austin Lines on his Vertical Ice Climbing Enthusiasts (VICE) expedition to Kyrgyzstan this month. The month-long expedition will test the climbers’ skills and offer adventure. KMC Systems has set up a Web page to track Austin’s adventure. The site includes a Google Earth tracking module to follow his progress and links to regular blog posts that include updates from Austin as he checks in throughout the trip. The expedition began with VICE co-founder Jeff Longcor’s desire to conquer an unclimbed peak, the inspiration of his friend Ed Walsh, who, before passing away from cancer, taught him that your dreams can’t wait – and the discovery that five friends were already planning a trip to Central Asia. The team of six arrived in Bishkek the first week of July and is climbing in nearby Ala-Archa park to adapt to the new environment. They will then travel by helicopter to the Djangart Region basecamp in the “Forbidden Mountains”. The much-attempted, never-summited Point 5318, the highest peak in the region, is the group’s first objective before checking out surrounding peaks. Austin has been with KMC Systems since November 2011, testing and designing medical systems. “So far I’ve been working on testing platforms for instruments transitioning to manufacturing, and now I’m moving more from a supporting role into more of a test platform project leadership role: so, designing and getting everything organized - getting all the requirements in place,” Austin said. KMC Systems medical device engineers “Take It To The Top” of medical device engineering and mountains. As Austin takes it to the top of an unsummited mountain, his fellow engineers take client medical devices to the top of ISO 13485 and FDA medical equipment standards while saving time and money through our KMC360® program. For more information on our contract medical design and manufacturing program, visit KMCSystems.com or download the KMC360® Brochure. KMC Systems is a leading, global provider of medical device contract manufacturing and engineering services. Through our KMC360® program, we provide centralized product development, medical device design, manufacturing and support services. KMC360® streamlines communication and leverages expertise while focusing on world-class quality, reduced development costs and reduced time to market throughout the entire medical product life cycle. Elbit Systems of America is a leading provider of high performance products and system solutions focusing on the commercial aviation, defense, homeland security, and medical instrumentation markets. With facilities throughout the United States, Elbit Systems of America is dedicated to supporting those who contribute daily to the safety and security of the United States. Elbit Systems of America, LLC is wholly owned by Elbit Systems Ltd., a global electronics company engaged in a wide range of programs for innovative defense and commercial applications. For additional information, visit: http://www.elbitsystems-us.com. Elbit Systems Ltd. is an international defense electronics company engaged in a wide range of programs throughout the world. The Company, which includes Elbit Systems and its subsidiaries, operates in the areas of military and commercial aerospace, land and naval systems, command, control, communications, computers, intelligence surveillance and reconnaissance ("C4ISR"), unmanned aircraft systems ("UAS"), advanced electro-optics, electro-optic space systems, EW suites, airborne warning systems, ELINT systems, data links and military communications systems and radios. The Company also focuses on the upgrading of existing military platforms, developing new technologies for defense, homeland security and commercial aviation applications and providing a range of support services. For additional information, visit: http://www.elbitsystems.com. This press release contains forward looking statements (within the meaning of Section 27A of the Securities Act of 1933, as amended and Section 21E of the Securities Exchange Act of 1934, as amended) regarding Elbit Systems Ltd. and/or its subsidiaries (collectively the Company), to the extent such statements do not relate to historical or current fact. Forward Looking Statements are based on management’s expectations, estimates, projections and assumptions. Forward looking statements are made pursuant to the safe harbor provisions of the Private Securities Litigation Reform Act of 1995, as amended. These statements are not guarantees of future performance and involve certain risks and uncertainties, which are difficult to predict. Therefore, actual future results, performance and trends may differ materially from these forward looking statements due to a variety of factors, including, without limitation: scope and length of customer contracts; governmental regulations and approvals; changes in governmental budgeting priorities; general market, political and economic conditions in the countries in which the Company operates or sells, including Israel and the United States among others; differences in anticipated and actual program performance, including the ability to perform under long-term fixed-price contracts; and the outcome of legal and/or regulatory proceedings. The factors listed above are not all-inclusive, and further information is contained in Elbit Systems Ltd.’s latest annual report on Form 20-F, which is on file with the U.S. Securities and Exchange Commission. All forward looking statements speak only as of the date of this release. The Company does not undertake to update its forward-looking statements.